Most of us are afraid of the wrong things. When we worry about dying, for example, what often comes to mind is a terrorist attack, natural disaster, homicide, an airline crash—or, perhaps, the result of a drug overdose or some idiot’s car running a traffic light. But a comprehensive study of what people actually die from shows that these are far less likely to cause your death and mine than more mundane events like contracting heart disease, cancer, or a serious respiratory disease like pneumonia. In fact, if you look at the accompanying chart, natural disasters account for only about one hundredth of one percent of all fatalities, and terrorism is not much more of a factor, accounting for six hundredths of one percent of global deaths. Airline crashes are too rare to be included in the chart, but would rank somewhere near the very bottom. The chart makes the case that most of us succumb to diseases, of the heart, lungs, diabetes, cancer, and dementia. 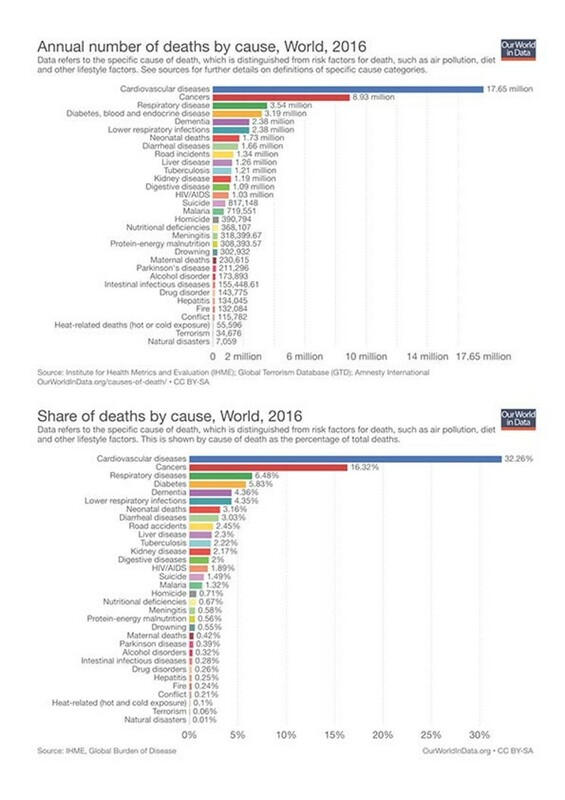 Road accidents, accounting for just 3.03% of all fatalities, are the leading accidental cause of death, followed (among non-diseases-related causes of death) by suicide (1.49%) and homicides (0.71%). Drug and alcohol disorders are even further down the list. These are not trivial numbers, but they are also clearly not among the greatest risks to our lifespan. What does this mean from a practical standpoint? Perhaps our attention should be turned away from fear of terrorism and homicide to the more practical—and potentially beneficial, from a longevity standpoint—issue of taking good care of our health with diet, exercise, and a bit less worrying about the scary stuff in the news.